I'm just sitting on the couch in the family room, though there's plenty going on. 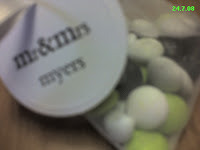 The wedding trellis is being strapped in the back of a pickup, and the girls are bagging lime green and white M&Ms. And the sweet tea is in the fridge, just where it always is.